As a hospice nurse, Tena “T.J.” Leich helps patients through some of the most difficult moments of their lives. But not long ago, T.J., 58, needed help herself. 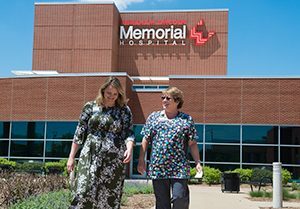 When she suffered a dangerous pulmonary embolism, the lifesaving care she received at Abraham Lincoln Memorial Hospital (ALMH) and Memorial Medical Center (MMC) inspired her to return to her hometown and serve others. “I feel like I’ve been given this gift, and I want to give back,” she said. In October 2016, T.J. traveled from her home in Florida to visit her daughter in Lincoln. During her visit, she woke one morning desperately struggling to breathe. She knew immediately that something was seriously wrong. Her daughter called 911, and paramedics arrived within minutes. Despite her fears, T.J. said, the first-responders put her at ease with their professionalism and calming demeanor. “They never let on that I was in grave danger,” she said. She was brought to the Emergency Department at Abraham Lincoln Memorial Hospital, where physician Sabina Modelska, DO, diagnosed her with a pulmonary embolism – a blood clot blocking the pulmonary artery. For some patients, like T.J., the symptoms of pulmonary emboli can come on suddenly, Dr. Modelska said. Other patients experience gradually worsening symptoms like shortness of breath or chest pain. It’s important to get treatment immediately; when undiagnosed, the condition can be fatal. Supplemental oxygen was used to help T.J. breathe and increase her oxygen levels. She was also given heparin, a blood thinner, to help treat the blood clot. Afterward, Dr. Modelska said, she showed significant improvement in her clinical condition. Once her condition had stabilized, members of the Critical Care Transport Team handled T.J.’s transfer to Memorial Medical Center in Springfield, where she received further treatment. The team—a collaboration between MMC, ALMH and local paramedic services—provides a registered nurse and a paramedic who ensure that patients in critical condition receive the intensive care they need during their transfer. Dr. Modelska said that patients like T.J. benefit from strong continuity of care and continuous quality improvement efforts within Memorial Health System. She added that the small-town atmosphere at ALMH helps build a sense of community between providers and patients. T.J. spent six days in the intensive care unit at MMC, and the following two months recovering at her daughter’s home. A Lincoln native, T.J. had worked at both MMC and the Southern Illinois University School of Medicine before moving to Florida 13 years earlier. As she regained her strength and lung capacity, she made a life-changing decision to return to Illinois and put her 35 years of nursing experience to work for the organization that she credits with saving her life. In February 2017, she joined the team at Memorial Home Hospice. Today, she serves patients and families in the Lincoln area, easing their end-of-life journeys. She’s glad that her own journey didn’t end that day in October – and that staff at ALMH and MMC were there when she needed them. “It was just a wake-up call about the preciousness of life,” she said.